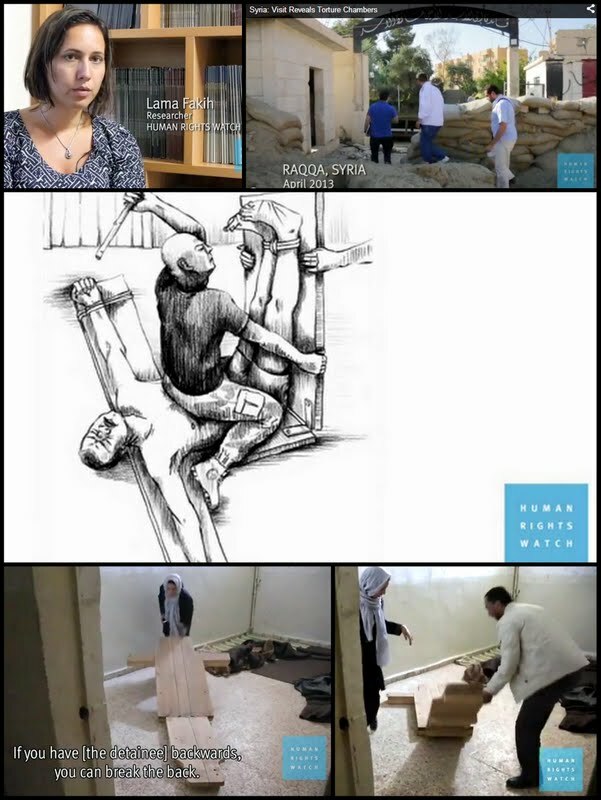 Clockwise from top left, HRW's Lama Faqih, HRW researchers in Reqqa and "bsat al-reeh"
In the State Security facility, Human Rights Watch researchers observed on the ground floor and in the basement, rooms that appeared to be detention cells. Among the documents were what appeared to be lists of security force members who had worked there. Human Rights Watch researchers also saw a “bsat al-reeh” (بساط الريح) torture device in the facility, which former detainees have said has been used to immobilize and severely stretch or bend limbs. Four said that officers and guards in the facility tortured them. They identified Mohammed al-Ahmed, also known as Abu Jassem, as the person responsible for their interrogations, and in some cases, abuse. Raqqa residents interviewed by Human Rights Watch said opposition fighters killed Abu Jassem during the battle for control of Raqqa, which came under opposition control during the first week of March. Based on information from former detainees and defectors, Human Rights Watch previously identified the locations, agencies responsible, torture methods, and, in many cases, the commanders who were in charge of 27 detention facilities run by Syrian intelligence agencies across the country where torture has been documented. The systematic patterns of ill treatment and torture that Human Rights Watch has documented point to a state policy of torture and ill treatment and therefore constitute a crime against humanity.